1-DIN DVD Receiver with 7" Flip-out Display, Spotify®, and AppRadio One™. DVD/CD/AM/FM Car Stereo, Spotify & Pandora Control and AppRadio One. It features a motorized 7-inch touchscreen display, detachable face security, and a new clear resistive touchscreen that provides brighter, more vibrant colors and increased touch sensitivity, making it more responsive than traditional resistive touch panels. 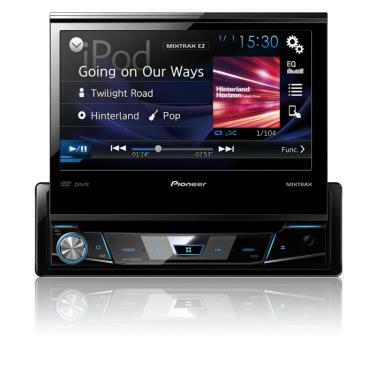 The AVH-X6800DVD has the ability to view and control compatible iPhone and Android smartphone apps to easily access your digital lifestyle from the receiver's touchscreen using a one-cable connection. With Spotify being a dedicated A/V source, you now have the ability to control content from the Spotify app on iPhone and Android devices. Also, offers FLAC file playback capability at up to 48 kHz/24 bit high resolution CD-quality audio playback. Now, you can enjoy superior sound quality and full control of the Pandora experience in your car directly from the touchscreen display of the receiver. You are able to give tracks "thumbs up" or "thumbs down," bookmark a song so you can purchase it later, easily switch between your personalized radio stations, and view full track data. MIXTRAX makes automatic remixing of tracks extra quick and easy. Simply connect your USB compatible device and listen as tracks are joined by various random sound effects in nonstop mix play to keep the groove going in full swing. AVH-X6800DVD comes with Easily upgrade to navigation with the addition of the AVIC-U260 add-on navigation system. This versatile hideaway unit allows you to switch to navigation mode with the touch of a button. Get to your destination by inputting an address or search through the POI library while enjoying whatever source is currently playing. Select among five colors, for the display and 112 different colors to match unit illumination to your vehicle's interior lighting.